Computer software provide tools to create audio slideshows typcially requires several steps: organizing the images, setting up a microphone, narrating while the slides displays, exporting the file, and then finally publishing it to a web site. The process is cumbersome and portability is limited. In contrast SonicPics for iPod touch, iPhone, and iPad (although not yet native) is an elegantly simple, all-in-one mobile solution for creating audio slideshows — still images synced with audio as they relate to each image — that provide enhanced online and mobile learning opportunties for students as compared to audio only media. 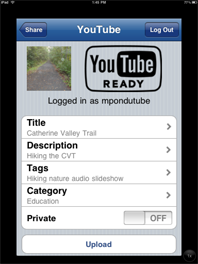 The slideshows can be exported as QuickTime chapter videos or uploaded directly to YouTube for instant sharing! SonicPics requires a microphone and imports images from your iPhone, iPod touch, or iPad's Photo library. Tip: There are a number of iPod touch microphones available, varying in quality and price - some up to $40 each. I have tried these low-cost mics with good success. For under $5.00 on Amazon the Mini Capsule Microphone is of surprisingly high quality, although it is really small and easy to misplace. Lecture recording - Use a set of related images or export a series of JPEG's from a PowerPoint or Keynote export and record notes as you touch drag through each image. Conference notes - Take photographs during the conference and then record your notes and reflections. Photo tours - take photographs of tours such as hiking and then record your experiences as they relate to each photograph. I look forward to creating audio slideshows on my own for instruction, sharing experiences, and exploring new ways for engaging learners. However, imagine the possibilities when audio slideshows are created in collaboration, especially on an iPad. Students can create group recordings by touch dragging through images, recording their reflections either spontaneously or by reading from prepared text, and passing the iPad on to the next person. Projects can can be uploaded to YouTube for sharing or exported as an.m4v chapter video, which can be played standalone in QuickTime or Windows Media Player or embedded in a web page. Can you add to this sampling of project ideas? Tours or field trips - students take photographs, which are uploaded to the iPod touch or iPad using Apple's Camera Connection Kit. Create audiobooks - students create their own digital image (photograph, drawing, scan, downloaded file) and then upload them to a Drop.io or Dropbox share. Using Dropbox or Droppler app upload the images from the share directly to an iPhone, touch, or iPad Photo library. Students can record poetry or sing songs as they relate to each image. Language instruction - Using the same scenario as an audiobook expect that students record in a foreign language that they are studying. Digital Story Telling - Students take their own photographs and then record a story, slide by slide. In the recent time that I have been using an iPad, I would say that SonicPics has been unexpectedly one of my favorite and most useful apps. I wait in anticipation for the iPad native version. Create an iPad native app, which would improve the interface, add new features such as App sharing and of course improve the resolution. Provide an option to export slideshows as enhanced podcasts so they can be played back on a mobile device. Currently iPhone OS 3 does not allow third party apps such as SonicPics to directly transfer media content to iTunes, which would eliminate the currently cumbersome process of file export, Wi-Fi sharing, entering a URL, downloading, and copying to iTunes. I like this app... if only my iPod touch had a camera, it would make using this app that much easier. Sorry that I missed your comment until now. Although I have been using SonicPics and the iPad Camera Connection Kit to import photos from a camera http://www.ilounge.com/index.php/reviews/entry/apple-ipad-camera-connection-kit , you could try a workaround for your iPod touch. Mount the camera on your PC or Mac desktop and drag selected photos to a Dropbox (http://dropbox.com) folder. Then use the iPod touch Dropbox app to access the images and save them to your Photo Library. Note: for now the iPad Camera Connection Kit is incompatible with the iPod touch and iPhone.